Wireless routers make your life better, so you might say the best routers are wireless, hands-down. A wireless connection makes it easier for you to connect to the web, download, and even save you money because they are far more cost-effective than their older wired counterparts. Chances are that you have a broadband connection at home, and you probably have a wireless router, too. It’s a good thing because wireless routers allow for quick data transportation from the internet straight to your device in an instant. Of course, if you’re looking at this article, you may also be in the market for an upgrade. Naturally, you’re going to want something that has the latest configurations and supports the newest standards with room to grow. If you’re not familiar with a router, it’s a crucial device that does a lot for the network you’ll have in your home. Simply put, a router allows for your local network which consists of your personal laptop or another device to connect to the internet on the outside. You may have also heard them called residential gateways. You can look at a router a few different ways, but perhaps the most important is the way the router acts as a line of defense from a virtual security attack into your home. A router can actually help you keep your system and personal information safe. All routers connect to various other networked devices, and wireless routers do this without actually being physically connected to wireless devices. Wireless routers also do not require things like drivers to do their job on any operating system because they’re not physically connected to your systems. Routers will assign each device on the network a unique IP address so they can communicate. Some of the more common brands that you’ve probably seen include Linksys and Belkin in addition to many others. A router will connect to your modem which is usually provided by your ISP via the internet port. The modem then connects to the wall, and from there, your ISP controls the rest on the way out. A wireless router connects to multiple wireless devices without having a single hard or wired connection, and also typically supports various wireless protocols. IP addresses are assigned by your wireless router to your wireless devices so that they can communicate on your home network and make it out the gateway to the internet. What types of routers are there? The most common ones that you’ll be interested in for home use are either dual-band routers or triband routers. Each of the ones listed below fit into one of these two categories. Dual-band routers are routers that offer two different operational frequencies to use – 2.4GHz and 5GHz. These types tend to be less expensive and will still offer a decent connection. A dual-band router is perfectly fine for your average household with kids that like to stream the latest Teen Titans Go on Netflix. Triband routers are more recent developments in the networking world. They have three bands that include the two that came with the dual-band plus an additional 5GHz band. 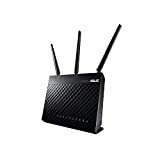 These routers are best suited for individuals that love gaming or are intense internet users. You can buy the latest wireless routers from many different places. You’ll find them on Amazon for pretty reasonable prices. You’ll also find them at electronics stores like Best Buy and Fry’s Electronics. You will see them inside of office supply stores, too, like Office Depot or Staples. When you go out looking for them, be sure to check the fine print like warranties, return policies, and possible price matching if the store happens to offer an incentive like that. The expected costs for the best routers can be quite pricey because they deliver nothing except high-quality performance. Typically, triband routers are more expensive because they have more features and a better handle on network speed. If your budget does not allow for a higher price, then you can absolutely go with something less expensive like many of the dual-band routers. You’ll be happy to know that some models actually offer similar features as the higher priced models, so you don’t necessarily have to sacrifice quality for cost. All of these routers have been reviewed by comparing specifications, tests that were run on them, in addition to actual customer experiences with these various products. It’s important that you get the correct information, so we work to provide you with accurate and up-to-date information. Since technology is always changing at a rapid pace, we know you want to have the most current specs at your fingertips. Prices range from right around $100 and upwards of several hundred dollars. They do offer multiple configurations which is why the price varies so widely. Some of them have multiple USB ports that allow for direct connectivity to a network printer or other type of box like a media server. Others are very basic and just connect to the modem to provide you with a wireless signal throughout your home or office. Super simple to use and very inexpensive by comparison, you can find a set of three different mesh access points for under $ on Amazon. There might not be any bells and whistles on this setup, but you’ll love how much faster your internet gets if you have lots of walls that get in the way of your wireless signal. You’ll also be happy to know that you can monitor your network from your phone or your computer relatively quickly as needed. You can also limit kid device access, and see who is logged on at the click of a button. Google Wifi has decent connectivity speeds, too, although they don’t report specifications. CNET tested the speed and found that it was capable of sustaining a top speed of 470Mbps, and you connect to each device seamlessly as you wander around your home. 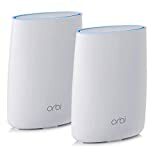 Also known as the Netgear Orbi Home Mesh Wifi System, this router offers some amazing features that will remind you of the Nighthawk line, also by Netgear. It’s simple to set up and get working, plus they claim 5,000 feet of coverage with the two that come in the initial package. The package includes the router unit and a satellite unit to expand the reach of your home network. This setup is a bit larger than some of the other mesh network offerings like Google Wifi, but if that doesn’t bother you, then you’ll be supremely happy with the overall performance. 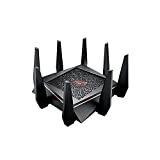 If you’re into gaming, then this is an excellent choice of router. The speed is fantastic, and it supports plenty of ports, too. There are almost too many features to name, but we’ll try. Part of the Republic of Gamers collection, this tri-band router has two bands at 5GHz and one band at 2.4 GHz with a combined throughput of up to 5300Mbps. Yeah, it’s fast. You’ll also find eight antennas, two USB 3.0 ports, two dedicated gaming ethernet ports, and six other ethernet ports you can use to link to improve your data connection. Are you drooling yet? It gets even better. Inside, you’ll find a 1.8GHz quad-core processor, AiMesh support, built-in malware protection, Game IPS, Range Boost capabilities, and so much more. The price is quite a bit heftier than most, but you’ll certainly get what you pay for with the AC5300. This router is an excellent option for just about anyone. The wireless is fast, and it supports a dual-band configuration. You can’t mount it on your wall, though, but you should be happy with the overall performance.